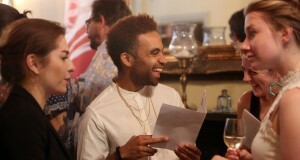 On Wednesday 15 July 2015, Sound Connections hosted their summer 2015 Would Like To Meet… networking event for the music education sector at the gorgeous 1901 Arts Club in Waterloo. Delegates and colleagues joined us for wine, music, nibbles, giving them and us a great chance to meet, share and learn from others. Would Like To Meet… is a wonderful opportunity for freelance practitioners, community musicians, music and arts organisations, local authority contacts and Music Education Hubs to come together to network and talk the talk. This Would Like To Meet… event was particularly special as we were celebrating the 5th birthday of Sound Connections’ collective of musical-minded young Londoners, Wired4Music. Once attendees arrived, they had the chance to grab a drink, settle in and browse the provided delegate list to see who they would be particularly interested in chatting to. The Sound Connections team acted as ‘match makers’ for the evening, introducing colleagues and kick-starting conversations. Sound Connections Director, Philip Flood, gave a speech welcoming attendees to the evening and encouraging everyone to meet and connect with as many new people as possible. Philip also launched our Just Giving campaign as a part of the Wired4Music 5th Birthday celebrations, offering the chance for attendees to donate £5 via text towards the continuation of Wired4Music for the next couple of years. We are now engaged with over 430 Wired4Music Council members from 32 of the 33 London Boroughs and in the past year we have provided over 50 youth-led activities with Wired4Music, including our third annual Rising Futures Youth Voice Symposium, in partnership with the Roundhouse, choir performances at RBS Headquarters, co-facilitating talks with the National Youth Orchestra and delivering youth voice consultations with young people across London. This is work that Sound Connections is immensely proud of and hope to continue throughout the next phase of our work. We also celebrated the anniversary of Programme Manager Nicky Dewar, who has been with Sound Connections for 10 years and who was well known to so many Would Like To Meet attendees, having worked so closely with them over the past decade. Congratulations Nicky! Based on previous feedback, this Would Like To Meet… gave attendees the opportunity to meet guests who share their particular area of specialism or interest by curating networking ‘hotspots’ throughout the evening. Themes ranged from early years music-making, to working with young people who face challenging circumstances, and youth voice and empowerment. These streamlined conversation starters, hosted by Sound Connections staff, meant that attendees could really get the most out of their networking time by meeting like-minded people. We hope that these conversations were the starting point for future collaborations. A huge thank you to all those who joined us. Curated networking hotspots fuelled by the passion and dedication of musically-minded attendees made this the best Would Like To Meet… yet! And of course, thanks go to all who helped celebrate Wired4Music’s 5th birthday by donating towards the continuation of our work with young people. If you didn’t get a chance to join us or were too busy making new connections, you can still donate £5 by texting “SCSC11 £5″ to 70070 or by visiting our donation page on our website to wish Wired4Music a happy 5th birthday. We look forward to seeing you all again for the next one in November!